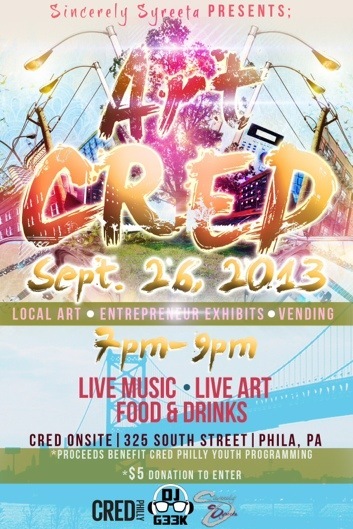 On Thursday, September 26th from 7 p.m.-9 p.m., lovers of food, art, music, and youth development are invited to join SincerelySyreeta.com and CRED Philly for SS Presents: Art CRED. At SincerelySyreeta.com, we believe that commerce and art can be married to drive social impact and ultimately brighten the future of our city. We’re celebrating artists of various genres in an effort to support CRED Philly’s unique art programming for our city’s youth. As guests enjoy great art, food, cupcakes courtesy of Sweets by Candace, drinks courtesy of Spodee wine [it’s “wine with a kick”, you know ;-)]and live music, you’ll also have the opportunity to drive social impact. CRED Philly youth. 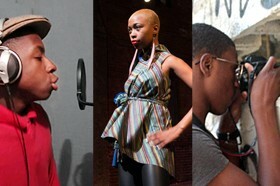 Courtesy of VillageArts.org. Your work, your dream and your passion matters to the future of our city. Your ideas will eventually shape the social, political, educational and business landscape of Philadelphia. We think the rest of our city–the CRED Philly youth especially–should know about what you do and how your working to positively impact our future. So get your hands a little sticky as your dreams find a home on the “Philly’s Future Matters!” vision board, which will be presented in person via the SS team to CRED Philly’s youth. Art supplies will be provided. Attendees are encouraged to bring business, organization and/or brand promotional materials for inclusion on the vision board. Press and Media are welcome to cover! Also, free advertising on SS as well as a featured interview on SincerelySyreeta.com will be raffled. A $5.00 donation is required for entry admission. Cost covers admission and food. CRED Philly: CRED is an arts and culture magazine that supports Philly’s young artists, designers, journalists, activists and entrepreneurs by providing them with opportunities to contribute and curate published content as well as advertise their business and services. The mission of The Village of Arts and Humanities is to support the voices and aspirations of the community through providing opportunities for self-expression rooted in art and culture. The Village inspires people to be agents of positive change through programs that encompass arts and culture, engage youth, revitalize community, preserve heritage and respect the environment.